Short Board is one of the most popular board of all. 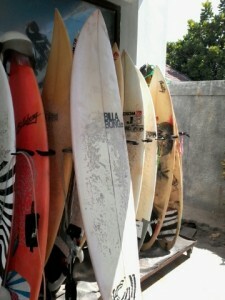 To be able to ride shorter length board, you would have to have good amount of surfing experience. Since short board has less buoyancy, you have to be able to balance on the board well, paddle harder, and to know how to catch a wave. Reward is better control and maneuverability, also be able to ride the decent size wave. Kuta Beach also has good short boardable points around. Fun board is a board somewhere in between short board and long board. 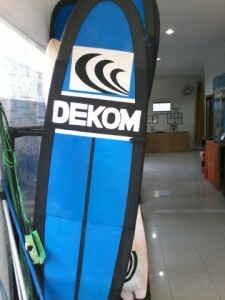 It has characteristic of both short, and long board. Our beginner’s fun board is great for children leaning for the first time or for adult who have gained enough balance on the longer board. Fun board is also great board to take out on Kuta beach. Especially on small, or medium size waves. Our surf school also has fiber glass made fun board for rental or for intermediate classes.